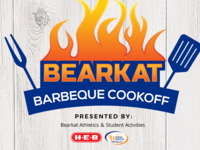 Join Bearkat Athletics and SHSU Student Activities for the Bearkat Barbeque Cookoff on Wednesday, February 6 at 5:30 PM. The event is free to attend for all students, faculty and staff with their Bearkat OneCard. The cookoff is open to all organization, departments, and colleges on campus. Categories include chili, brisket, and ribs! CASH PRIZES for our winners! Wow! This event was so much fun -- so many people came! I cannot wait for next year!